First and foremost, your outdoor lighting should create a safe and inviting atmosphere outside of your home. 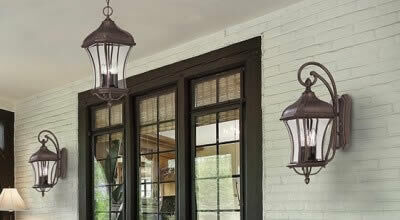 With so many styles of outdoor lighting available today, how do you select the right fixtures for your home? Read on to find out more about the basics of selecting and placing your outdoor lighting, no matter what space you want to illuminate. At your home's main entrance (usually the front door), your outdoor lighting should illuminate the lock and help you identify visitors. 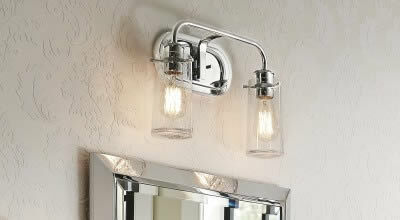 A good choice is using an outdoor wall light on either side of the door. Secondary entrances should also be well-lit, but a single fixture will normally suffice for those other entrances. Although many homeowners prefer decorative outdoor lights at the home's entrance, the most important thing is not how it looks, but rather that the fixture provides enough light without causing glare. 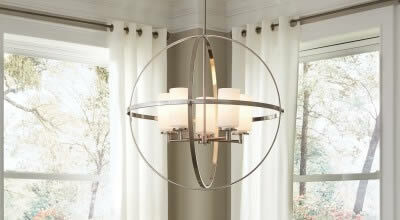 It is a good idea to choose a design that lets plenty of light pass through. 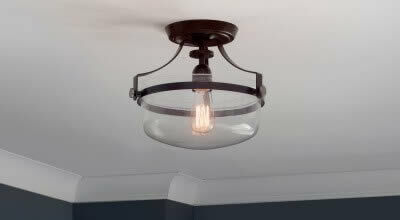 To light breezeways, paths or other passages, you'll want to use fixtures that are not too bright. 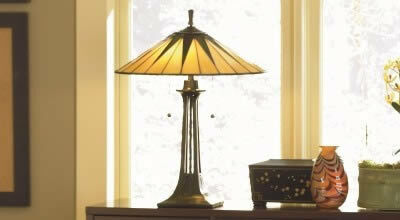 Choosing a fixture that is too bright makes it harder to see the ground at night or anything around you! If necessary, use a series of outdoor lighting fixtures, such as landscape path lights, to light these spaces. To ensure that your deck or patio is a functional social space, mount outdoor lighting fixtures at the height of your patio furniture cushions. This will keep people from getting harsh glare in their eyes when they sit down to enjoy the space. Test the height before installation to make sure there won't be any discomfort, especially for shorter or taller people. When planning outdoor lighting for your patio or deck, pay special attention to areas where activities are performed, like around the grill or at the poolside. Consider adding extra task lighting wherever it's needed. At the driveway turn in, think about using a pair of outdoor post lights to announce your property. They don't need to be overly bright to be effective, but you don't want to skimp on quality here. It'll make it easier for visitors to find your home. Consider adding extra lighting over the garage door for an added measure of safety. (Garages of different sizes are best served by different variations of lights--check out How to Choose the Right Size Fixture for more information.) If your driveway has a basketball hoop, it too can be easily illuminated from the roof line. For easy maintenance and energy savings, you may want to consider a light with a photocell or timer so it turns on and off automatically. Need more advice? Contact us or give our trained lighting specialists a call at 1-866-688-3562. 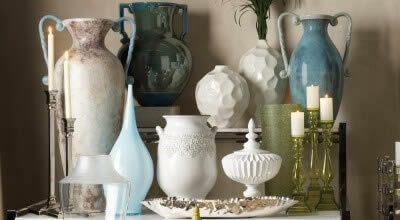 Sign up for our email newsletter today and score an additional discount!